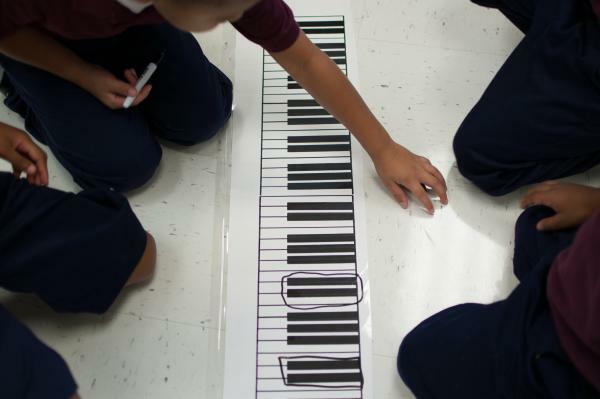 The kids are asked to circle groups of two black keys. The headsets allow the instructors to speak directly to one student or a group of students . Welcome to the Piano Lab. 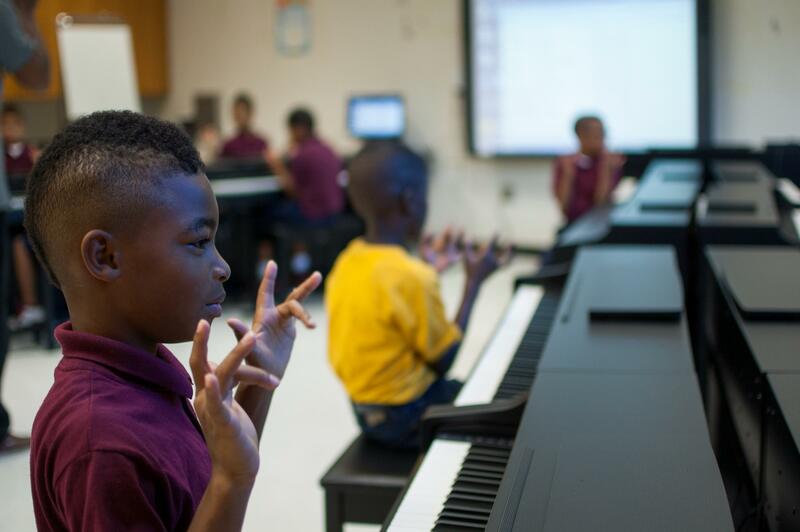 Just after first bell, 16 third graders at are sitting on the floor of Winbourne Elementary’s “piano lab” - the first of its kind in the district. One by one, lead instructor Stephen Watkins seats each of the students at a piano. Some of the kids can’t reach both ends of the keyboard even if they spread their arms out all the way. Watkins asks them to guess how many keys there are. The guesses range from low - 24, 30 - to as high as a hundred. Finally Watkins tells them that each piano has 82 keys. 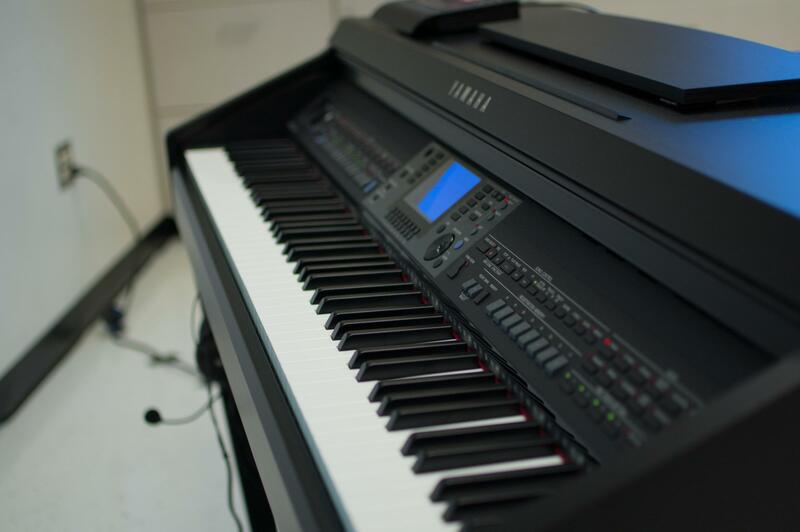 These Yamaha Clavinoa pianos are actually electric keyboards, but they look like traditional cabinet pianos, with the pedals and music stand and everything. 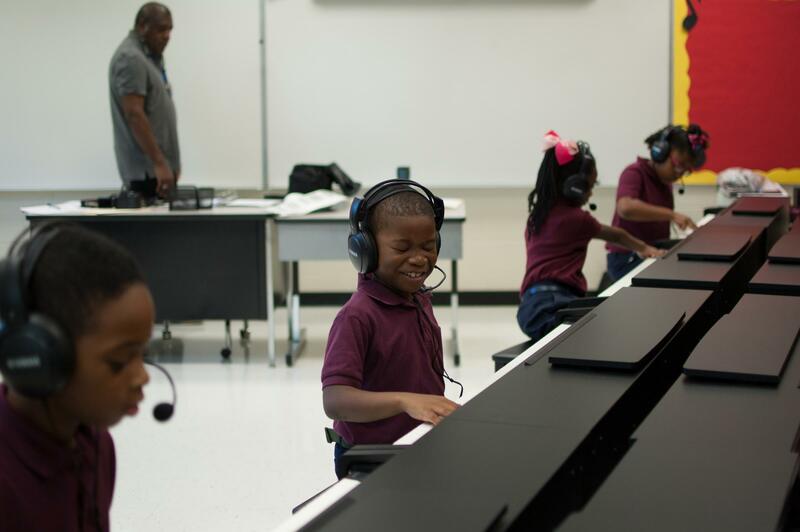 Each instrument is equipped with a headset, which allows the kids to practice without disturbing the class next door -- that was a big selling point. Instructors can also talk to individual students directly into their headsets. Robin Yee, one of the instructors, has the kids test them out, making sure they can hear her voice. These pianos, loaned to Winbourne by Yamaha. Usually, companies will rent them to universities. 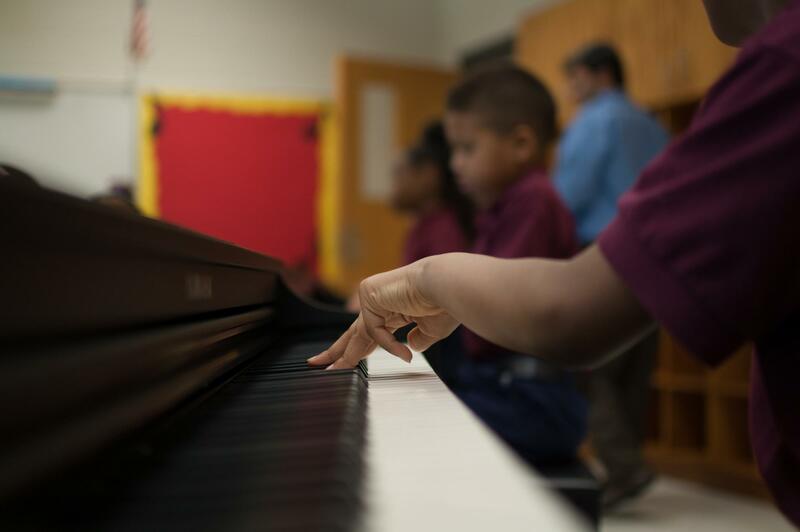 This is the first time that Yamaha is participating in a program like this, where pianos are made available to elementary school students as part of a highly focused carefully built curriculum. "We chose third grade in this particular case study because we thought we would have a good chance of success and it was a good foundational age," says Raph O'Neill, owner of O'Neill's Music House in Baton Rouge. 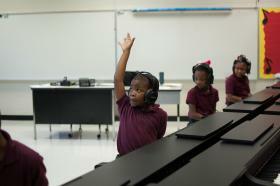 "We know math and science scores tend to do better with musicians," he says. "We know that music lends itself towards math and science skills, so we wanted to see if we could, as a music business, help fundamentally assist kids in the third grade here at Winbourne and hopefully throughout East Baton Rouge Parish, with a music program." After O’Neill had gotten Yamaha’s support, he went to the school board and asked which school would be best suited to house the piano lab. Winbourne was their first choice. That makes sense to Watkins, who’s been teaching at Winbourne for six years. "Why wouldn’t you pick a school that has struggling readers," he says, "children who have social challenges at home?" Almost all of the students at Winbourne qualify for free or reduced price lunch -- 98 percent, which is much higher than the district average. Only about half of the school’s third graders are proficient in Math. Only about 30 percent are reading and writing at grade level. And Watkins says even though the lab has 16 pianos, he chose 18 students to participate, because it’s not uncommon for some students to move in the middle of the school year due to unstable home lives. 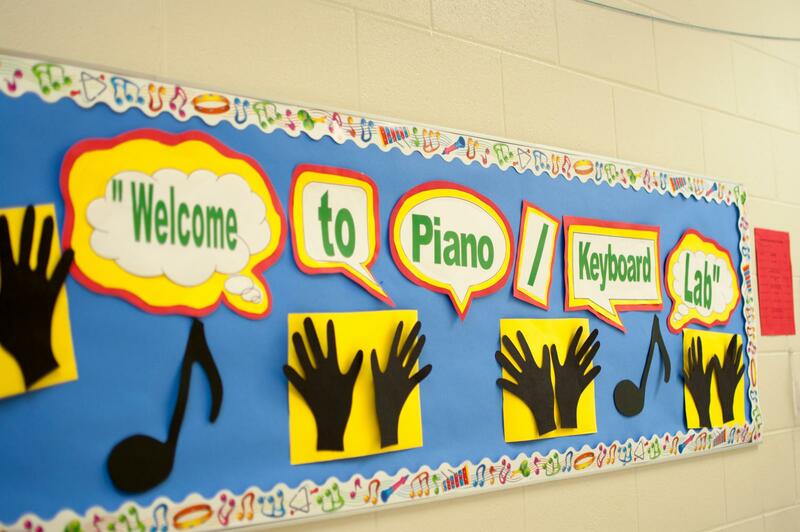 Watkins met with parents and students a few days before the first class to answer questions and get parents’ permission for their kids to participate in the Piano Lab. 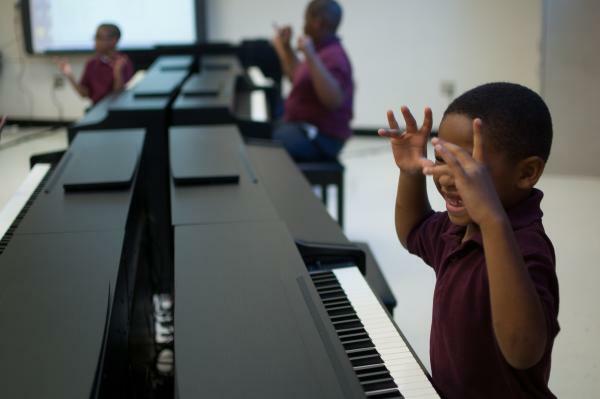 He promised parents their kids won’t be taken out of any core subjects such as math or science to be a part of the piano lab. When all the permission slips were filled out, they got to see the lab for themselves. By the holidays, the kids going to put on a Christmas concert, where each group plays a different section of instruments as an ensemble. Raph O’Neill, who sells these pianos for a living, demonstrates how this can be done on a freshly assembled Clavinova. First he plays a grand piano, then presses a few buttons. A Bossa Nova beat begins to play, and he taps out the first notes to "Spanish Harlem" on what sounds like an acoustic guitar.  Bellwether Technology presents Music Under the Oaks, in partnership with Loyola College of Music + Fine Arts and WWNO. This week on Continnum Milton Scheuermann and Thais St. Julien present a program of early music featuring four CDs whose names begin with "La". are: La Folia (Jordi Savall et al) Alia Vox AV9805; La Messe des Fous (Barry Harward Consort) BNL BNL112746; La Dolce Vita (King's Singers & Tragicomedia) EMI CDC 7 54191 2; and La Bele Marie (Anonymous 4) Harmonia Mundi HMU 907312. Meschiya Lake & The Little Big Horns have been playing together as a band since 2009. But their repertoire suggests a much longer, deeper history, dating back to the early part of the last century, when people were buying phonographs and drinking absinthe in its original form.